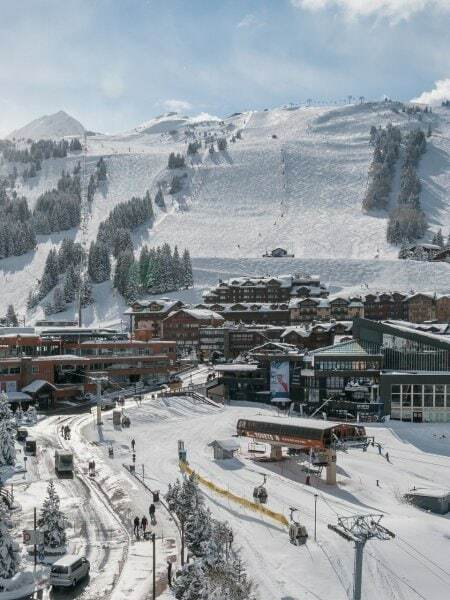 Welcome to Courchevel, the international prestigious resort located in the 3 Valleys, the world’s largest ski areal (600 km of pistes). The five Courchevel’s villages are all home to ski-in/ski-out accommodation. Both skiers and non skiers will discover a unique and magical valley through the wealth of activities on offer, from sheer relaxation to adrenalin filled action. Whether you are looking for tranquillity or excitement, culture or unforgettable experiences, anything is possible in Courchevel! Aim for the exceptional! A 60m x 30m outdoor ice rink, a curling rink, and a 250-seat restaurant. Such was the face of the ice rink in the beginning. The space was designed in 1967 before becoming technically obsolete, and a new infrastructure was created for the 1992 Winter Olympics in Albertville. Located in Courchevel 1850, the rink enjoys an elaborate architecture designed especially so that it can transform into a conference room, performance space or sports centre as and when required. Lovers of winter sports are bound to appreciate skating in a space once used by the world's great athletes! In the heart of Courchevel and located in the Le Chabichou four-star hotel, this restaurant accommodates customers in an inviting atmosphere and serves sophisticated cuisine already rewarded with two Michelin stars. The elegant dining room of blond wood will please customers with the harmony of colours. There are various menus to choose from (a winter menu is specially designed for off-season visitors) and an excellent wine list. Bowling de Courchevel invites you to relax and enjoy some time in its complex. While there’s plenty of classic bowling on offer with 8 lanes equipped with bumpers for children from 4 years, you can also enjoy billiards and a room full of arcade games. It also has a restaurant and bar which offer a range of evening options during the season. And for those who have an event to celebrate (birthday, stag or hen party), don’t hesitate to contact the venue. Massages and other treatments are also on offer to help you relax and loosen up your muscles after a hard day’s downhill skiing. Fancy doing something out of the ordinary? Jump on board a snow groomer, impressive vehicles for manipulating the pistes. There's a beginner's session for the adventurous among you! Once on board, enjoy an unusual initiation into the secrets of grooming. With friends or with your children, immerse yourself in the daily lives of the people who prepare your pistes and experience grooming from the inside!